Wow, I just realized it's been a week since my last post! Where does the time go? 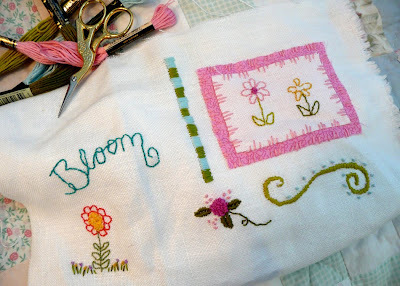 I've been busy following along with the gals in Teresa McFayden's Freestyle Embroidery class making this spring sampler and I really, really am enjoying it. Hand stitching is one of the most restful, peaceful, types of crafts to do. You can do it anywhere; take it with you anywhere. So portable and so satisfying. I was re-introduced to it last summer in Charlotte's class at ArtFiberFest where I made this. We had a bit of a distraction in the class (those of you who took that class with me know what I am talking about) but it didn't even matter because we were all so busy concentrating on our hand-stitching. Have you seen this magazine yet? It is officially due out tomorrow, but copies have been popping up little by little all over the place. 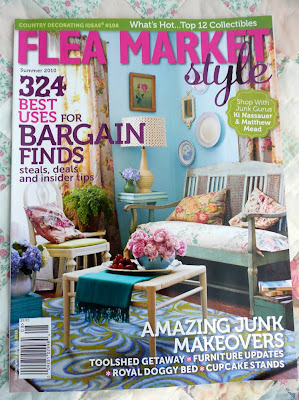 Flea Market Style is a collaboration between the amazingly talented Matthew Mead and Ki Nassauer (formerly of Junk Market fame). Like me, many of you have been following along with Matthew and Ki during the entire inception of this magazine, which I liken somewhat to waiting for the birth of a new baby. Well let me tell you -you MUST get yourself a copy when you see it, because it is definitely worth the long wait. And yes, Mr. ground hog was correct about the 6 weeks of more winter. And here's the proof - more snow! I was up early and snapped this photo. 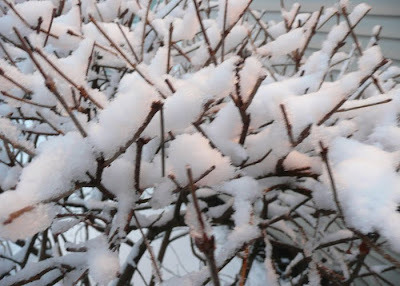 Everything looked so pretty with a fresh dusting of the white stuff. But regardless of it's lovely look I am still wishing for spring. i love your stitching project Jeanne!!! Oh that sooooo makes me want to pull out my pretty pink embroidery threads and get right to it! sweet embroidary! I bought that magazine over the weekend. Its wonderful! Ive looked at it several times already. I love your sampler!! I'm following Theresa's examples to loosely on placement- I've seen some wonderful alternatives out there!! Just beautiful!! I have been stalking B & N trying to find this issue with no luck. Hopefully tomorrow.